These pushfit coupling fittings allow you to connect a length of MDPE pipe to an imperial threaded fitting. To maintain a rigid and reliable joint connection, it is highly advised that a pipe liner (also known as a stiffener or insert) is also used. 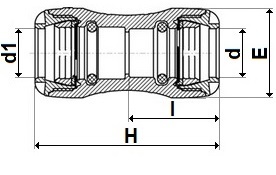 PL Pushfit Coupling Metric to Imperial 20mm x 1/2"
PL Pushfit Coupling Metric to Imperial 25mm x 1/2"
PL Pushfit Coupling Metric to Imperial 25mm x 3/4"
PL Pushfit Coupling Metric to Imperial 32mm x 1"